When the electrics at your property go wrong, it is almost certain that it will be at the most inconvenient time. That’s Murphy’s Law. An electrical fault at home can be quite stressful as indeed it is for a business owner with staff unable to work and the business paralysed. But help is on hand – South London Electricians operate an emergency call out service that will get you back up and running fast. In fact, 95% of our emergency electrical call out jobs are completed on the first visit. 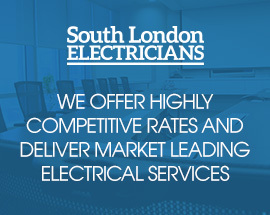 Operating in most areas of south London, it doesn’t matter whether it is a blown main fuse, a strange smell coming from a socket, a DIY incident or even a fork truck driver damaging warehouse cabling – our NICEIC accredited and experienced London electricians have the expertise to tackle and fix any electrical problem. No job is too small for us. You can rely on our electricians to arrive on time, they will be helpful, efficient and complete the work with minimal disruption to your domestic or business routine. All of our work is carried out to BS 7671 (IEE) standards to fully meet safety regulations. Between calling us and our London electrician arriving, there are a few things that you can do in preparation. The more information you can provide when he arrives, the faster your electrical fault will be repaired. If it is a problem with a light, check if it is just one or if there are others affected. The same goes for sockets. If your central heating is not working, check if any of the other appliances like your dishwasher or TV work. Check also if all of the electricity supply been lost or is it just a certain circuit? But make absolutely sure that you take no risks – if in doubt, do not touch anything – leave it to the electrician. Using the latest and best electrical safety test equipment, South London Electricians will systematically test your electrical wiring, installations and appliances to isolate and repair the fault. Simple. Hassle free.